At the core the business of insurance is related to Claims Processing. The claims environment is extremely reliant on process speed and accuracy to meet customer demands. Try our RPA Solution Today! 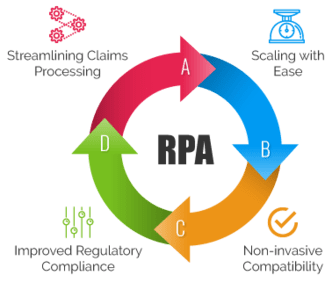 RPA is the automation of a wide range of administrative tasks through specific software algorithms that interact with multiple applications and computer-centric processes with cognitive and analytics, to execute transactional processes at User Interface (UI) level. It is best and most commonly employed for rules-based, predictable, and replicable processes that require handling high volumes of structured data. It is an intangible asset. Removes the human element from a multi-step repeated task. Digitally Transform Your Business Operations Now! Thinking about the use of RPA within the following business functions, What stage of maturity have you reached? Make A Transition To Automation Today!